P.S. 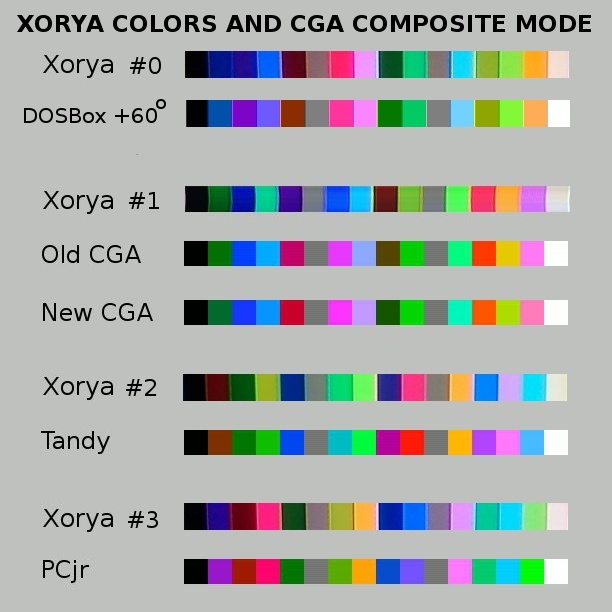 Color order similar to palette #0 (orignial Xorya palette) could be simulated by DOSBox in CGA mode when color phase is shifted to +60 degees (12 times Alt-F11). I wasn’t ready to see a Mandelbrot processed in real time like that but, damn that was pretty good. That’s a hell of an implementation. xorya is very interest project!! I make onboard computer for my car s pomocí video generatoru KenKen's work (version PIC32MX695F512H resolution 300X225). The problem was the need for more timers for scaning RPM,tacho and injection time. instead of the original location of the RPM meter. Xorya engine is also in addition to game console certainly well suited for use in technical applications such as measurement, process control, etc. Needed to display graphs, different menus etc. Very interesting area of application is in combination with composite camera and maybe OSD. similar programs for PIC32 is not much yet, and if so only in black and white variant. 1. how much performance mcu video generator consumes? 2. how much timers video generator needs? 3. It is possible to gif and jpeg load from sd card ? 4. You can use some doblebuffer for smoother images and animations? 5. You plan to add routine for playing wav file ? 6. It would turn your engine used for simple OSD principle PICOOSD ? 7. You could also write a program for MikroC for PIC32 (from MIKROE) compiller or help with his transcript? Yet the question at the end. My hobby is technique rather than programming, so I prefer Basic Compilers than c Compilers. Unfortunately, so far not a single basic compiler does not have a proper library for generating color composit signal. When I started work KenKen's generator, so I founded the forum thread asking whether someone could port this engine, but no one was found. He would not it you? If so, it would be asking a great work establishing a new wiki page with a description of the library and nutty example !! If I understand it Xoriat engine does not affect the load mcu? Xoriat really does not use assembler, and is completely written in C? Kolik potrebuje xoria paměti sram pro rozlišení 160X200 16 color ? Is it possible resolution 320x200 16 (or more) color? If so, what is the need for additional hardware? Xorya therefore uses TIMER2 and all the compare unit (PWM out So you can not work?). Timers 0,1,3,4 are therefore fully available for free? How can I load a GIF or JPEG file into the flash memory chip and displayed ? It is possible to change the font or font size ? Maximite is interpreter and not compiller. is slow and only 8 color (in color version). Is very special and limitation against natur PIC32. More interesting is necessary Firewing PIC32.It is free and trying to be similar to the Arduino. It's a basic compiller based VB.NET. (see http://www.firewing.info/). Unfortunately, this does not support TV out. I don't know how to measure it, but it looks like it doesn't affect CPU (may be setup of DMA will steal some CPU cycles, but it's unnoticable). I run it on largest PIC32 DIP device - PIC32MX170F256B (256KB flash and 64KB data), but I think it could fit into a little smaller one - it needs 18KB for videomemory (640x200 monochrome or 160x200 with 16 colors and color burst). With a little hardware it could be possible to have CGA-like 320x200 4-color mode, but for 320x200 16-color it will need more external logic and rewritten library (theoretically it's possible on the same PIC32 device, but with different connection and I didn't think about it yet). About font - you can have any 8x8 font there. If you need to change size of the characters then some parts of the library have to be re-written (actually you can render any font using direct access to videomemory without changing library).